You are here: Home » Sweet Poison: How Did This Deadly Toxin Find Its Way to Our Markets? Sweet Poison: How Did This Deadly Toxin Find Its Way to Our Markets? “Last year I decided to do the right thing and try to rip off a bit of the weight that has crept up on me over the years. As well as dusting off my old push bike and increasing my physical activity, I made a few dietary changes. My wife and I both have a sweet tooth, and if there’s chocolate in the house, it will get eaten, so we cut out a lot of things like that. “After making, what I thought were positive changes, I started noticing I was getting bad headaches, and a tightness of my neck and back muscles. They started off as just something that would happen now and then, but increased to almost every night. I tried everything, and nothing worked! “Finally, I took a step back and thought about each thing I had done differently in the last 6 months. Then it hit me! In trying to lower my sugar intake, I had swapped sugar in my tea and coffee for Equal. Could that be responsible for my headaches? One of my colleagues told me this story about his journey to health a number of years ago, and it stuck in my memory. How many other people out there are experiencing a range of health issues but are unable to pinpoint what may be causing it? Could you be one of these people? Are you someone who just knows that you can’t give up that sweet taste to your tea or coffee, but are concerned for your health, and your waistline at the same time? There is an alternative that could be just what you have been looking for—and it DOESN’T lie in harmful man-made sweeteners! We’ve been fed the lie for years that aspartame, also known as artificial sweetener 951, is the most thoroughly-tested food additive ever released, and that it is completely safe for human consumption. What most people don’t know though is the secret dirty deals that were done behind closed doors to get this product on the market. These days, a stroll down your supermarket aisles will lead you to countless products that contain aspartame: diet soft drinks, sugar-free gum (and even some gum that ALSO contains sugar!) 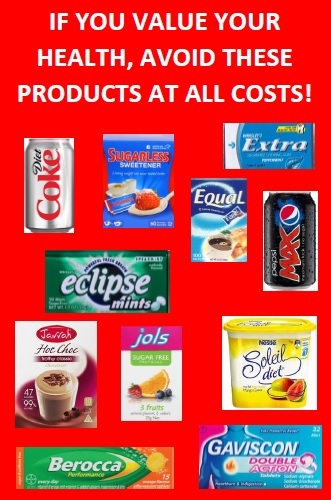 and sugar-free lollies, sugar-free ice-cream, diet jelly and Equal are just some such products. Many people consume such products, believing they are doing a service to their health—and they would be horrified to know that the common ingredient in them all is a CHEMICAL, a MAN-MADE INGREDIENT, not something that comes from nature, like food is supposed to. Essentially, aspartame is a poison to our bodies, which can change the behaviour of the synapses in our brain, and with long-term use, even change the structure of our DNA. It has a particularly negative effect on the nervous and endocrine systems, as its prolonged consumption can cause it to accumulate in the body. The body, in turn, metabolises methanol into formaldehyde. That’s right, that chemical that is used for EMBALMING DEAD BODIES! All three components of aspartame are released into the bloodstream shortly after its consumption, to begin wreaking havoc on your body. Aspartic acid is what is known as an excitotoxin: a chemical that causes brain cells to become so excited that they burn themselves out and DIE. Repeated exposure to excitotoxins can lead to impairment of brain function. IT COULD BE SLOWLY KILLING YOU. Aspartame has been linked with a wide range of health problems. Just a few of these include seizures, dizziness, brain tumours, spotted vision, multiple sclerosis, double vision, headaches, and fibromyalgia. What is it about aspartame that makes it so bad? Let’s take a little look back in time, to the ‘60’s—1965 to be precise. This was the year that aspartame was discovered, when a researcher by the name of G.D Searle was testing an ulcer drug. He accidentally licked his fingers after getting some of the substance on them, and noticed its sweet taste. He realised that it would be far more financially-profitable to market the substance as a sweetener than an ulcer drug, and championed for its approval by the FDA. Fast forward a few years, in 1974, aspartame was approved for limited use. However, what you might not know is that it actually wasn’t until AFTER it was approved that G.D Searle and the manufacturers of aspartame supplied the FDA with their (albeit highly questionable) research on the substance. In 1976, the FDA released a 500-page report, demonstrating the manipulation that had taken place during the initial study designed to prove aspartame’s safety. This report led to a review in congress, and in 1977, the FDA council recommended that a grand jury be set up in order to investigate G.D Searle for fraud regarding the manipulation and falsification of data on aspartame and other products. As so often happens, however, money spoke. The statute of limitations on the charges ran out, deals were done, and the lawsuit was dropped. The FDA employees who should have helped to prosecute Searle were bribed with promises of great jobs if they let him go free. Seven such FDA employees who helped the substance to gain approval were subsequently given jobs in one of the industries that makes use of aspartame, such as the soft drink or chewing gum industry. Four years later, in 1980, the Public Board of Inquiry voted for the rejection of aspartame’s use until further studies were conducted which disproved its link with brain tumours. However, in 1981, only one day after Ronald Raegan was sworn in as president, G.D Searle reapplied for aspartame’s approval. During the approval process, three of the five FDA scientists who had previously examined the link between aspartame and brain tumours, were against its use. After a new panel member, in favour of aspartame’s approval, was found by the panel lawyer, the head of the FDA, Arthur Hull Heyes, overruled the Public Board of Enquiry, and approved the use of aspartame in dry foods. Sigh, yet another corprotocracy sponsored poison to watch out for. At least I can avoid this one. Fluoride however is much harder to dodge and pretty nasty stuff. Thanks Mick. I can’t take credit though. I have a new contributing author on board now. Frank is still getting set up but I have a health and well being contributor who was the original author. His website is EurekaWellness.com Stephen is his name. I just now put up his latest.